The other day I asked JL to get the Take-Along Swing out that we had from NHL. He got it out and below is a photo of JSL in it for the first time. This swing was something that NHL LOVED. He was always happy in it. He loved the movement and being able to watch things. It was also a great way to keep him up after eating. This week we are going to try to get the crib up into the room. 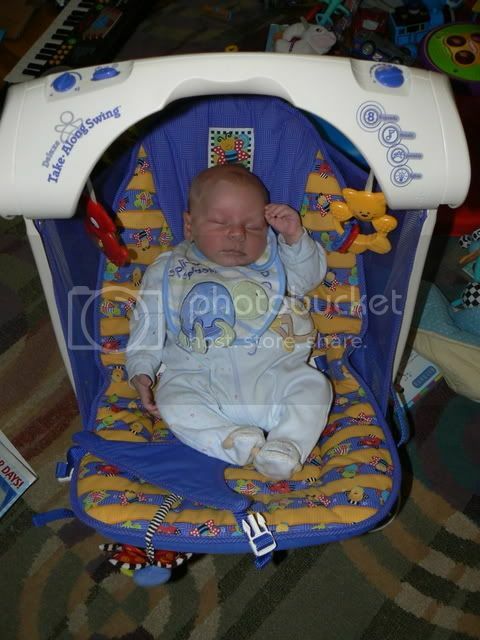 JSL is just all over the place in the Pack N’ Play bassinet. He needs more space to rest in when he’s in there. After all he’s now sleeping 5-8 hours more nights and only gets up once to nurse and then goes back to sleep soon after. In addition to sleeping, JSL is really starting to do more and more each day. He has already rolled over from his tummy to back at least once. He’s drooling and teething like crazy (and he’s only 7 weeks old). He likes to laugh and “talk” to people and smile all the time. Within the last week he started to really like playing with toys. He’s really figuring out that his arms can get/hit things that are in front of him. Here’s a photo of JSL playing on his play mat with some toys. As you can see when I tried to do tummy time with him the result was not quite what I was looking for. On that note I am off since I think I hear the little guy stirring. « What to do, what to do?? ?